Yes, you can earn 80% Profit or more! 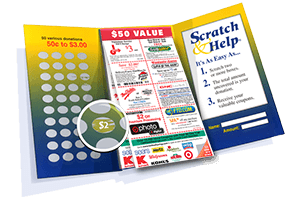 Scratch cards are one of the newer fundraising solutions available to youth sports, schools and charities. It can be a highly profitable fundraiser if you’ve got a motivated group. How does it work? Each scratch card has 50 scratch dots and a pad of coupon sheets. Your supporters will scratch 2 or more dots, which have to determine the amount of their donation, and as a Thank You, you’ll provide them with a coupon sheet that has 10 or more valuable offers for restaurants and shops in your area. Each card generates $100 for your group so even a small group of 10 can raise as much as $1000. Get Free info and Free Scratch Card sample here. What’s an order-taker? Simple! 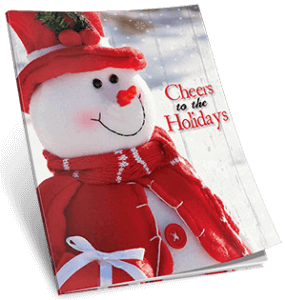 A short brochure or catalog containing products that you sell to your supporters. Typically, you keep 50% of everything you raise! With JustFundraising, they are completely free to start! Cookie Dough fundraising is still baking huge profits for non-profits from coast-to-coast. 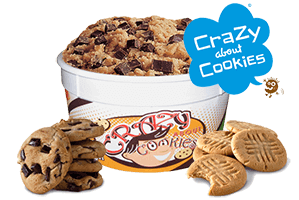 JustFundraising has partnered with Pine Valley Foods to provide an offering that includes the highest quality cookie dough in fundraising, a wide selection of frozen products ranging from cookie dough to cheesecakes, and beautiful sales material that makes selling a breeze for groups like yours. How does it work? JustFundraising provides you with 1 order-taker per seller, free of charge. Your group members will show the brochure to friends and take orders. You place your bulk order at the end of your 2 week campaign, and keep 30%-55% of what you raise. 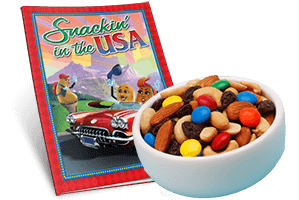 If you’re looking for selection, simplicity and satisfaction, the Snackin’ in the USA program will hit the spot! This order-taker offers 24 of your favorite sweet, salty, sour and spicy nuts and snacks, and they are all priced at a simple $7 making it affordable for almost anyone to support your cause. How does it work? Order 1 brochure per seller in your group and have them ask friends and co-workers to purchase one of more items, being sure to collect your funds up-front. Place your bulk order after a 2-week fundraiser, and keep 50% of all funds raised. Scented Candles suggest warmth and provide a wonderful aroma to your home or office. 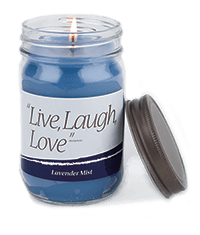 What’s even better, many of JustFundraising’s Heritage candle collections come labeled with inspirational quotes such as, “Be the Change you wish to see in the world”, “Live, Laugh, Love” and many others. The religious candle line is called Journey of Faith and comes labeled with scripture – i.e. the cinnamon apple is labeled ‘Love’ with the verse “The greatest of these is love” 1 Corinthians 13:13. The candles are packaged in canning jars and hourglass tumblers, and your supporters pay between only $14 and $16. Cheers to the Holidays is a unique holiday fundraiser, full of fun and festive gift-giving products. It includes over 200 items such as gourmet chocolates, gift-wrap, scented candles, functional kitchenware, your favorite magazines and much more. Most groups run it in September and October, so they can receive delivery in time for the Thanksgiving holidays. JustFundraising offers free student pre-pack which means when you receive your bulk order, it will be separated and packaged per student, so you’ll avoid hours and even days of product sorting! Groups keep up to 45% profit. Sometimes referred to as in-hand product or cash-and-carry items, they usually sell for between $0.50 and $2 each. You order them in bulk and then your group resells them for profit, usually doubling your money. The fundraising industry was born with the $1 chocolate bar. It’s been tried and tested for decades and is still the most popular fundraiser. 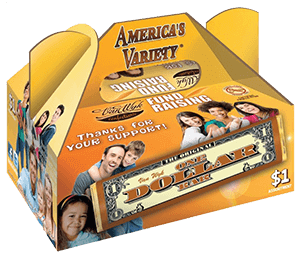 JustFundraising’s One Dollar Variety Pack allows your supporters to choose from 4 or 5 of the best-selling candy bar flavors including chocolate almond, creamy caramel and crispy rice. They also offer $2 bars, and the popular Hershey’s brands! How does it work? Determine how many candy bars you need each of your members to sell to reach your goal and order the appropriate number of master cases. With JustFundraising.com, you can order as little as 1 case and shipping is always free. Lollipops are so popular because buyers simply keep coming back for more! Sell by the handful in school hallways or the cafeteria, at snack bars or concession stands – and have parents sell at their workplace. 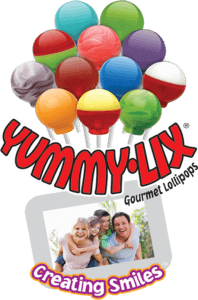 JustFundraising has the largest selection of lollipops in fundraising, from Mega Rounds, Yummy Lix, Color Blasters, Valentine pops, milk chocolate lollipops, to sport-themed suckers and so much more. They each come in a variety of flavors such as cotton candy and wild cherry. How does it work? Each master case, includes 576 lollipops and costs only $144 – you sell them for $0.50 each, so you’ll raise $288 per case. With JustFundraising, you can order as little as 1 case at a time and shipping is always free. 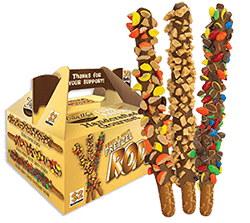 Pretzel rods are the hottest new $1 sellers in fundraising and the perfect mix of sweet and salty. These 7 ½” salty pretzel rods are dipped in chocolate and then rolled in your favorite sweets such as sprinkles, toffee crunch, and chocolate chunks – yuuuummy! You can get the variety pack, the super 60 pack, the concession pack which is packaged in a convenient display box, or the $2 pretzel rods which are double-dipped in chocolate and sweets. Again, JustFundraising offers a minimum of 1 case and free shipping. Get more info on Pretzel Rods here. KEY FACTORS FOR YOUR FUNDRAISING SUCCESS! 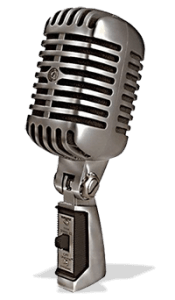 Interview with Jolian Grant, President of JustFundraising.com. A: Jolian Grant, JustFundraising: “Firstly, know WHY you are fundraising. Having a solid purpose behind your fundraiser increases member participation, and inspires more financial support. Telling members and supporters that you’re raising money for your school is not as engaging as saying we’re raising $5,000 to buy 500 more books and 5 more computers for the library to provide our students with better learning resources and after-school help. Be specific! Another factor that is often overlooked is setting group and personal goals. When we ask our customers how much they need to raise, they often tell us as much as possible! Once you’ve determine your WHY, you should be able to easily determine the exact funds you need, to reach your goals. Then, break it down per seller, so they have a clear target. Complement that with a prize program to help them reach for even greater numbers and you’ll be off to a great start!